A 6-month-old Husky puppy found in an SUV after a high-speed police pursuit last month is now available for adoption from the Riverside County Animal Services shelter in Jurupa Valley, Calif. When the pursuit ended, the puppy’s former owner, John Garcia, shot California Highway Patrol (CHP) Officer Felix Serpas, who survived and is recovering. The puppy has been named “Chip” in honor of Serpas, according to a news release. Garcia was taken into custody and charged with attempted murder. As you can imagine, the shelter has received many offers to adopt Chip, who is energetic and should be with someone who enjoys an active lifestyle. In other words, couch potatoes — and apartment dwellers — need not apply. For the special adoption price of only $1 instead of the usual $105 fee, Chip can be yours. However, animal services staff is requesting that his adopter donates at least $104 to the nonprofit California Highway Patrol 11-99 Foundation, which provides financial assistance to CHP employees and their families in times of crisis. 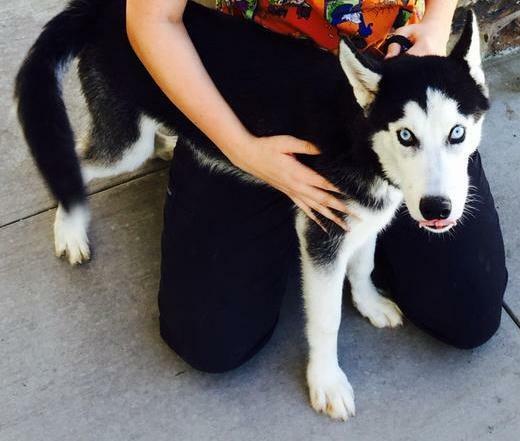 Potential adopters are welcome to visit Chip at the Western Riverside County/City Animal Shelter, and are also welcome to write a short, 500-word-or-less essay about why they want the Husky. Essays will be accepted through Sunday. They can be emailed to shelterinfo@rcdas.org or dropped off at the shelter, located at 6851 Van Buren Blvd. in Jurupa Valley. Chip’s new pet parent(s) will be announced Monday, Oct. 5.